While spending some Saturday time researching on Ancestry.com today, I became really curious about the Freelands (my great-great grandparents, and my middle name) who came to Kansas with New England roots, in the mid 1800s. Kansas, in the mid-1800s, was "Bleeding Kansas". Basically the Mason-Dixon line of slavery was broken by democratic vote in "slave-owning" Missouri, which was above the line, breaking the precedent. Kansas-Nebraska Act followed, and Kansas was to decide slavery based on the popular vote. This led to a "corporate responsibility" effort in Worcester, Massachusetts, where the "New England Emigrant Aid Co." sought to recruit anti-slavery northerners through advertising, convincing them of the moral opportunities in migrating to free territory in Kansas, which would develop and be sold for profit, while at the same time attracting pro-abolition votes for the upcoming state election. Officially, the Company was a profit-making venture, and how the settlers voted was of no consequence to the company....Thomas Webb released a pamphlet in 1855 stating that although the settlers sent to the territories would not be required to vote for one side or the other, they were expected to support the free-state movement. A number of abolitionists questioned the profit motive behind the company, and even many of Thayer's potential investors balked at the notion "that people might say we were influenced by pecuniary considerations in our patriotic work". 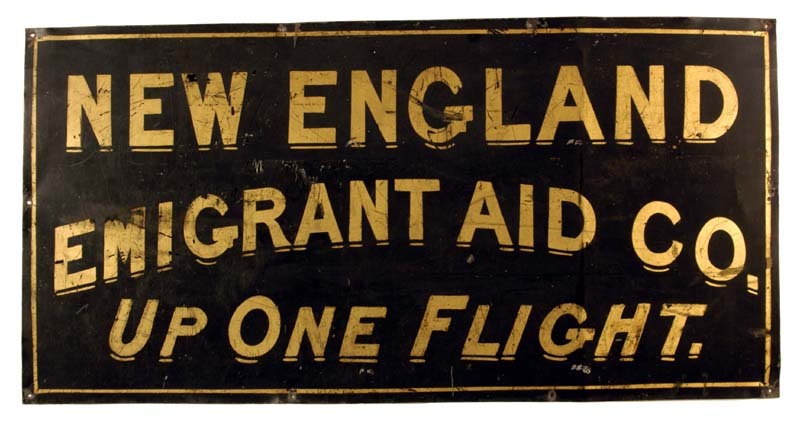 Although Thayer personally disagreed with such hesitations, in 1855, the Company reorganized as a benevolent society and changed its named to the New England Emigrant Aid Company. I'm just posting this history for two reasons. First, the debate in the paragraph above reflects many of the discussions I had with Jim Puckett of Basel Action Network during the creation of WR3A (Fair Trade Recycling). The idea that "profit" itself would doom the moral core of the venture apparently seemed to keep people from moving to Kansas and voting against slavery (though there are plenty of reasons not to move from your geographic - or philosophic - position). Second, the polarized politics and white-on-white violence that escalated in Kansas prior to the Civil War makes the current "Red-Blue" state divide seem quaint by comparison. Third, the historical analysis seems to be that the advertising by Thayer did more to recruit pro-Slavery folks from Missouri than it did to send Northesterners to Kansas. The modern equivalent is the "gun law" rumors which promote membership in NRA. My take is that it was a good idea, it was just harder for the company to move New Englanders to Kansas in 1850 than it was for pro-slavers to move Missourians to Kansas. John Brown got into the news afterwards, striking more closely, at Harpers Ferry WV.